Neurons or Nerve cells are the basic constitutional units of nervous system of all well organized multi-cellular animals. Check out this article to know more about neurons that includes the various types found in human body with their importance and role in conducting impulses. Neuron are the basic structural and functional units of nervous system of all animals. Nerve cells play an important role in forming the various organs like brain, spinal cord and various nerves of the body of all higher organisms. Nerve cells or neurons present in all these organs of nervous system will help to transmit impulses or messages from one part of the body to other parts. Thread like shape is an adaptation for Neurons or Nerve cells to carry impulses or messages for long distances. Nerve cells are one of the lengthiest cells present in all higher animals. Neurons can exist in a number different shapes and sizes but they are all designed to carry impulses or messages from one part of the body to other. A typical neuron include a Cell body (Soma), dendrites and axon. The Cell body of a typical neuron is considered to be large and has many shapes. At most it appears to be a star shaped body with a large nucleus at the center and surrounded by abundant granular cytoplasm. Due to this the Cell Body is also known as Perikaryon (Peri=surrounding and karyon=nucleus) as cytoplasm surrounds the nucleus. As neuron is an animal cell it include all cell organelles found in all eukaryotic animal cells except Centrosome. Due to lack of Centrosome in neuron, nerve cells loose the ability to divide and replicate. In the Cytoplasm, we find very many mitochondria to serve the much energy need of active nerve cells. With in the cytoplasm of the Cell body around the nucleus some black stained granules are present called Nissl Bodies or Nissl's granules. These Nissl bodies are small pieces of rough endoplasmic reticulum (RER) studded with rosette of ribosomes which are concerned with protein synthesis. The Cytons of the neurons are usually lie in the brain and spinal cord. From various corners of the Cell body or Cyton branched tree like process arise are known as Dendrons which end in fine branches called Dendrites. Dendrons and denrites are cytoplasmic extensions of Cell body. The dendrons and dendrites reach the finest part of the body and conduct impulses or messages towards the Cell body. Like Dendron, Axon is also a cytoplasmic extension from the Cell body. In some neurons it may be few millimeters in length and in some neurons it may measure more than one meter. The initial segment of the Axon is somewhat thick which is known as Axon hillock. An Axon will carry impulses or messages away from the Cell body or Cyton towards the axon end of the neuron. The Axons are also known as Nerve Fib-res. A bundle of Axons (Nerve Fib-res) covered over by a protective tubular sheath is known as a Nerve. The Axon on its outer surface is covered by a loosely arranged white continuous insulating layer called Neurolemma. The neurolemma layer is formed of single layer flat expanded Schwann cells. Next to neurolemma layer, the Axon is covered by a lipid-rich insulating layer called Myelin sheath or Medullary sheath. This insulating layer prevents the slipping away of impulses as they get transmitted from Cyton end to the Axon end of the neuron. As Myelin sheath is a continuous lipid layer, it will prevent the movement of sodium and potassium ions in and out of this Axon. Due to this, the conduction of impulses will be prevented along the Axon. So to prevent this, the continuous lipid insulating Myelin sheath is interrupted by small gaps or constrictions of one mm apart by Nodes of Ranvier. 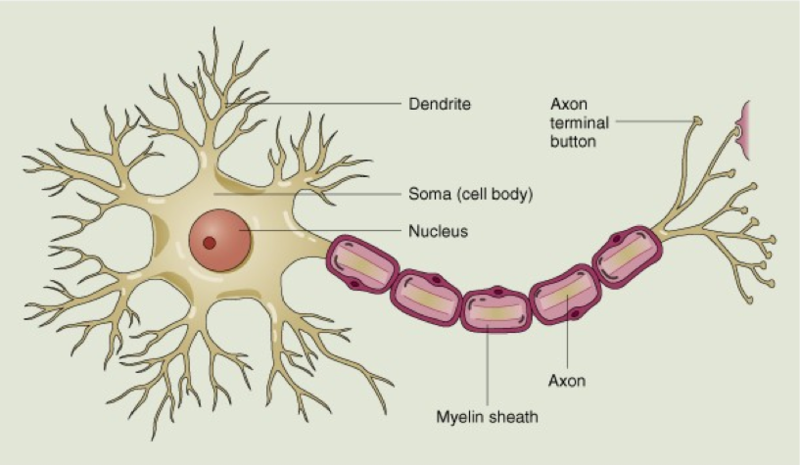 Those neurons in which the Axons are covered by Myelin sheath are known as Myelinated neurons. This type of neurons are usually found in higher Vertebrates and conduct the impulses at a faster pace. But those neurons in which axons are not covered by Myelin sheath are known as non-myelinated neurons. These neurons are usually found in lower group of Invertebrate animals and conduct the impulses at a slower pace. Actually the damaged Myelin sheath of Axons is repaired by Schwann cells present in neurolemma layer. Some Axons also may have some side branches called collaterals. The end of the Axon breaks up into fine branches known as branched end of the axon. These fine branches end with swollen endings called Synaptic knobs which store some chemicals called neurotransmitters for transmitting impulses from one neuron to the other. Unipolar or pseudounipolar: In this type of neuron both dendrite and axon arise from the same process. Most of the sensory neurons in our body are this type. Bipolar Neurons : Axon and single dendrite arise from the opposite ends of the Cell body. This type of neurons are less common. 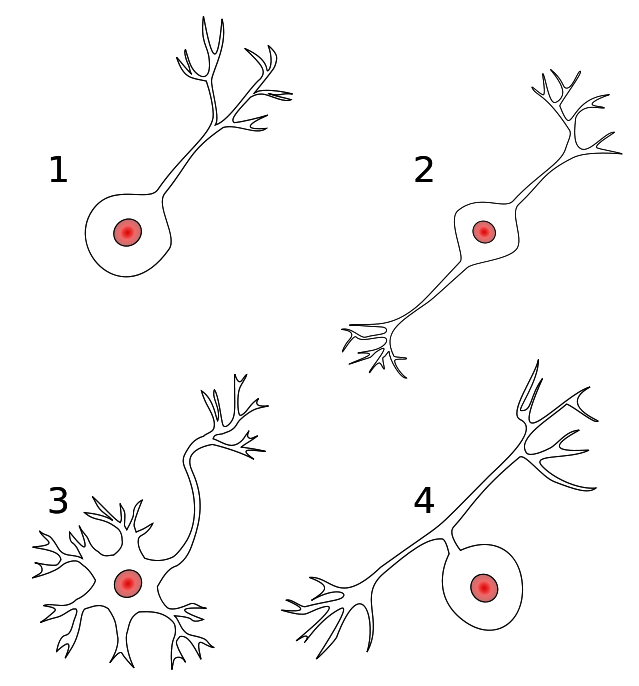 Receptors in the eye and receptor of nose are of this type. Multipolar neurons: : In this type of neurons two or more dendrites and axon originate from the central Cell body. In most parts of our body we find this type of neurons. Anaxonic Neurons: : In this type of neurons axons cannot be differentiated from dendrites. This type of neurons are found in brain. How impulses will be transmitted through the three types of neurons? Nerve fib-res in the sense organs all over the body carry impulses to the Cell bodies of Sensory neurons. From the Cell bodies these impulses travel through nerve fib-res of Sensory neuron into the Cell body of Associative neuron through a synapse with the help of a neurotransmitter like Acetylcholine. Then the impulse from Association neuron travels through its nerve fib-re to the Cell body of a Motor neuron through a synapse and neurotransmitter. Now the impulse from nerve fib-re of Motor neuron reaches the effectors like muscle or gland or organ by which they carry out the necessary action for the body.